The front wheel on the bicycle can detach, posing a fall hazard. Dynacraft has received one report of a consumer who fell and sustained scrapes and abrasions when the front wheel detached. 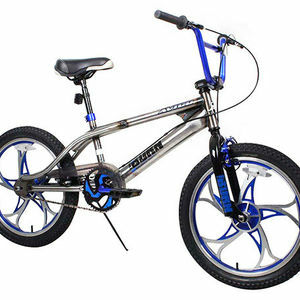 This recall involves about 3,100 20 inch Avigo Turn N Burn youth bicycles with model number 8107-62. The model number and date of manufacture, "08202013," are printed on a data label on the frame?s seat tube. The bicycles have a silver frame, blue handlebars and black front fork with blue accents, hand brakes and a kickstand. The serial number can be found etched on the frame on the underside of the bottom bracket shell. Serial numbers included in the recall have letters "DJFH" followed by a six-digit number between 026588 and 027104, and between 089533 through 090562; or the letters "DJFI" followed by a six digit number between 015107 and 015552, and between 100093 and 101193. Stop using the recalled bicycle and contact Dynacraft to arrange for repair. For more information, call the company at (800) 551-0032 or go online to dynacraftbike.com and click on "Owners," then select "Warnings/Recalls."